We have seen this species growing abundantly in lowland forest in Mexico, Belize and Guatemala. 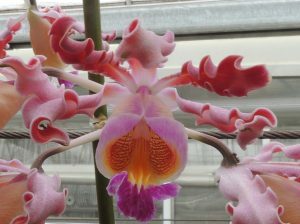 In Belize it is known as the horn orchid because of the shape of the large pseudobulbs. 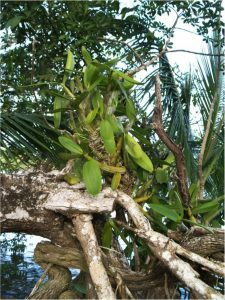 The plant shown here is growing on the edge of the Belize River near Belize City. In the wild the species makes large specimens exposed to bright sun in semi-deciduous forest where they share upper branches with epiphytic cacti. 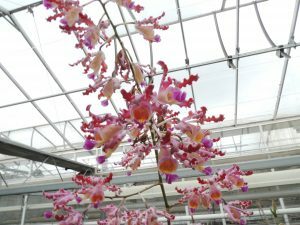 The name refers to the close relationship the species has with large ants that make their homes in the older pseudobulbs and defend the plant when it comes under threat. 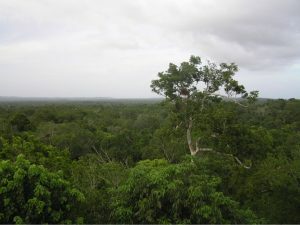 The Maya Biosphere shared by Guatemala, Belize and Mexico this lowland dryish forest was once the centre of the Mayan Civilization. The photograph here is taken from the top of a pyramid in Yaxha. In Yaxha we worked with the Private National Reserves of Guatemala to produce a field guide to the orchids of a community reserve and gathered a fallen Myrmecophyla tibicinis to relocate in a tree and rather painfully forgot about the ant thing – ouch! 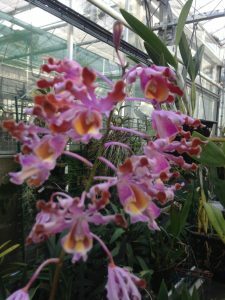 We grow the species in baskets and mounted in Warm Americas where they enjoy good light and plenty of water and feed when in growth. We have three clones showing the variation within the species only one clone has branching which gives a really dramatic display (top photos) and another clone is shown below.